No two businesses are the same. Customise your account, just how you want it. We understand that SMS communications are no longer restricted to a marketing or communications department, as other areas of business are adopting SMS as a principle way to reach customers and contacts. Whether it’s the HR department on the floor below or 100 chains or branches dotted around the country, you can now give log-in’s to other users with the right permissions, restrictions and access to the relevant parts of Messenger. Sharing log-in’s, address books, credit balances and templates becomes challenging as more staff and departments start to use your central Messenger account. 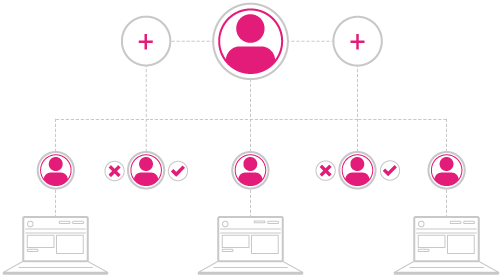 Set up as many sub accounts as you need and allocate them to certain users or departments. They can draw credits down from your account so you’ve still got full control of what you spend. Restrict and enable certain features in sub accounts to make sure secure information stays safe. You could lock down contacts for data security, remove access to account settings so nothing is altered or features such as surveys, ticketing and mobile pages to stream line their usage. Set pre-approved templates for your sub accounts to choose from when broadcasting a message. They only have the option to select these templates so you know that all content is accurate, on-brand and error free. You can make certain parts of the message as editable so if your sub users need to add custom information they can do. Send Approval allows you to set your master account as the approver of all outbound SMS. Your sub accounts and sub users won’t be able to deploy a message until it’s been marked as approved by you. If you’re not happy with it you can decline it and specify why, making sure it’s right the second time round.